Meet Marlee, our newest young adult giraffe. At 19-months-old and 998 pounds, Marlee stands 10 feet tall, but by the time she reaches full adulthood she’ll be 13 feet tall. 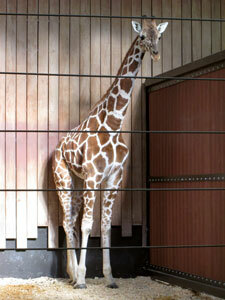 Marlee was acquired from Zoo Miami with the hopes she will breed with our 8-year-old male giraffe, Bahatika. There are eight different sub-species of giraffes. Most of the Milwaukee County Zoo’s giraffes are from the sub-species called reticulated giraffes known for their large brown spots separated by cream-colored lines, but Marlee is a hybrid giraffe since her ancestors were both reticulated giraffes and from a sub-species called Rothschild giraffes. Although she is considered a hybrid, her markings are very similar to a reticulated giraffe. If the outside temperature is at least 50 degrees or higher, you’ll find Marlee and the rest of the herd in the outside Giraffe Yard, otherwise look for them in the indoor Giraffe exhibit.